I’ve been on a bit of a history kick lately, mostly focusing on Bobby Kennedy and the late 1960’s. I’m not sure what prompted me to try 1776 , but I’m so glad that I did. It was AMAZING. One of the easiest 5-star reviews I’ve given. I’m always impressed by authors that can make history books read like fiction books. 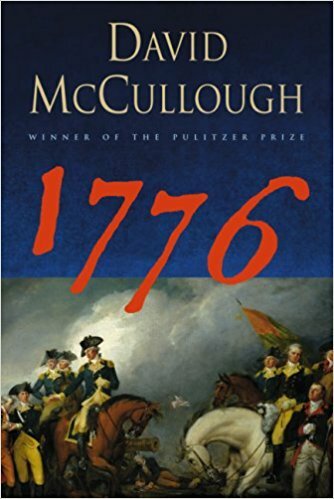 Fast-paced and story-driven, this book puts you right in the action of the beginnings of the Revolutionary War, focusing mainly on George Washington. What struck me the most was how incredible the odds were against Washington and his “army”, if you can call a group of men farmers that had little to no training, education, or official equipment (other than what they brought from home, which sometimes included hoes and shovels,) an army. Admittedly, I was a very poor student in history class. I found all of my history classes to be boring and irrelevant to what was going on in my life. While that is not the way one should approach their classes as a kid, I will say the side benefit is that when you actually learn about history later in life, you’re hearing things for the first time! You’re wondering what exactly happened at the Delaware River? !